The 2014 Bank of American Chicago Marathon is this Sunday, October 12th, and the gun goes off at 7:30am Central Time. Here's the link for Runner Tracking. I'll be wearing bib #344. 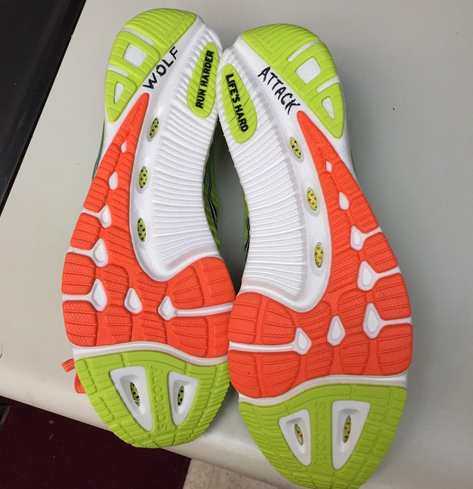 Men's Preview from Letsrun. Bekele vs. Kipchoge is going to be awesome. Over July 4th weekend Andrea and I debated whether it was even possible to get in reasonable marathon shape by October. We decided that if I used my time wisely, focused on my strengths (not my weaknesses), didn't race much, and kept the expectations low, it was worth taking a shot. 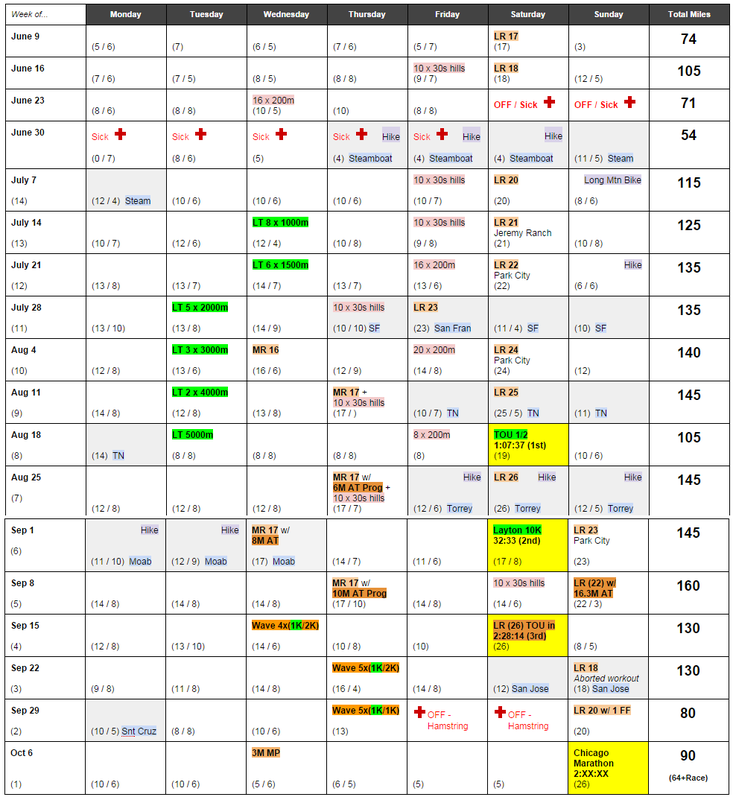 While timelines are arbitrary, I considered the week starting July 7th to be the beginning of my Chicago Marathon buildup, as that was when I laid out the first draft of the training schedule and mentally committed to the race. 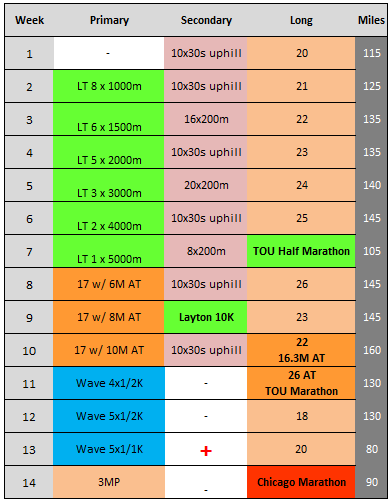 The first cycle of training was simple - a track workout once per week, building in repetition distance and decreasing in pace. Long runs got a little longer each week. I alternated 200s and 30s hill reps once a week as well. The TOU 1/2 was the first checkpoint: I won in 1:07:37. Winning is always nice, but after running 1:05:40, 1:06:03, and 1:05:39 the previous three years at the same race, it was obvious I still had a lot of work to do. After that race I was essentially done with interval-style workouts. I moved on to progression runs and eventually wave tempos. I kept the total volume high, and tried to run on grass/dirt as much as possible. 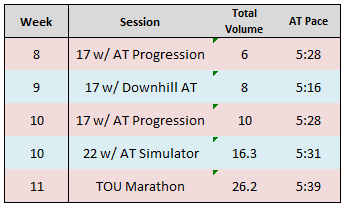 A few of the long runs got faster (a 26.2K "simulator" and the TOU Marathon). 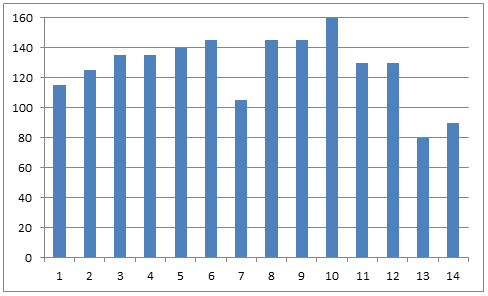 My workouts throughout this entire cycle were consistently quite a bit slower than I've run in past marathon buildups, and I didn't do a lot of race-specific workouts, yet I wasn't really too concerned. Aerobically I was building a very strong foundation, and I felt that would be enough to run well in Chicago, and then propel me forward to whatever comes next. Then about a week ago I did get concerned. My right hamstring, which has been bothersome (off and on) since the 2012 TOU Marathon, decided it was time to be annoying again. 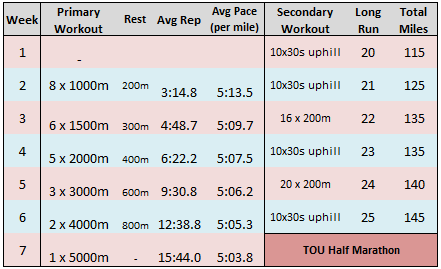 I had to take a few days off (rare for me) and basically throw my plan for tune-up workouts during the taper out the window. For a couple days I was a total basket-case and questioned whether it was even worth making the trip to Chicago. At this point I don't really know how it's going to hold up for 2+ hours of fast running, but I feel decent enough to toe the line and find out. Early in the summer, I said I'd be thrilled to get to a point where I felt like my PR was within reach by October. So that's what I'm aiming for on Sunday - under 2:20:41. -Created a template that I'll replicate (with adjustments, of course) next spring and fall. The training was smart. -I really enjoyed the training this summer. Running was fun, every day. There are a few things I will adjust in the next big buildup, but for now, I'm focusing on all positives. this summer, not breaking myself down. Eight-minute miles on grass/dirt are valuable! Wave runs over the last three weeks. The hamstring prevented me from doing these exactly as intended.